The first skyscraper ever was built to protect against fire. 133 years later, does the same design used in skyscrapers today still serve its purpose? In 1885, the world got its first ever skyscraper. When the New York Home Insurance Company wanted new headquarters in Chicago’s cleared-out downtown, they wanted it fireproofed, since the headquarters were being built following the Great Chicago Fire of 1871, which ate through the city’s mostly wooden topography. However, they also wanted it tall, with a capacity that could take up the maximum number of small offices above the bank floor. Of all the submissions they received in their open design contest, the company eventually selected William Le Baron Jenney’s metal-framed concept. It came to be that, long before other buildings had similar codes, the world’s first skyscraper was designed to be fire-resistant. But does the design used to build skyscrapers around the world really serve its purpose 133 years later? Even after all these years, emergency evacuations of skyscrapers still remain difficult worldwide. According to the National Fire Protection Association’s (NFPA’s) U.S. High Rise Building Fires Fact Sheet, between 2009 and 2013, U.S. fire departments responded to an average of 14,500 structure fires per year in skyscrapers. These fires caused an annual average of 40 civilian deaths, 520 civilian injuries, and $154 million in direct property damage. Out of all the skyscraper fires the NFPA responded to, 62 percent were in apartments and other multi-family housing. On the other side of the pond in the UK, on June 7, 2017, a fire broke out in London’s 24-story Grenfell Tower. By mid-day, the death toll had reached 79, with tens missing and presumed dead. “In my 29 years of being a firefighter, I have never, ever seen anything of this scale,” said Dany Cotton, the commissioner of the London Fire Brigade. Initially, the cause of the fire was unknown, but two weeks after the tragedy, London police finally confirmed that the fire was started by a fridge, which raised questions about how a fire that began in the kitchen of one apartment spread so rapidly though a 24-story high-rise building with 120 apartments. Earlier in April 2017, a fire broke out in a 72-story skyscraper in downtown Dubai as well, although the reasons were not identified and there were no casualties. We ask Robert Solomon, NFPA’s building fire protection division manager, if skyscrapers are a pain in urban security’s neck. He doesn’t think so. “Globally, we have literally tens of thousands of high-rise buildings and they are predominantly extraordinarily safe structures,” he tells progrss. “Modern era codes, especially in the last 30 years or so have been updated (at least in the U.S.) to layer in multiple systems, features and redundancies to make these buildings safe for the occupants as well as the first responders.” Many of these features are even added in retroactively to the stock of existing high-rise buildings constructed prior to some of these code enhancements. “These buildings provide great environments for working, living, and entertaining and I believe they really help define many of our cityscapes while improving the overall urban habitat,” he says. According to Solomon, skyscrapers utilize very conservative construction materials, also known as fire resistive construction. All skyscrapers must be protected with an automatic fire sprinkler system. And every high-rise building needs to have a building fire alarm system that can alert the occupants to imminent danger as well as allow the on-scene fire incident commander to relay real-time information through a voice communication system. For the evacuation process, skyscrapers must have a minimum of two well-designed exit stairs that are enclosed with fire-rated construction materials to keep the stair enclosures safe, allowing occupants to descend safely in case of emergency. Slideways: A Solution For Evacuating Skyscrapers? In June 2017, a group of engineers conducted a study in which they proposed a new solution – a special spiral slideway for better, faster, and more efficient evacuations in skyscrapers. The solution – as the name suggests – involved installing a spiral slideway device equipped with a shunt valve as a standard feature of skyscrapers. The slideway would enable people escaping fires to slide down to the first floor using gravity, without the aid of electrical power, making it suitable for emergency evacuations and inclusive of mobility-impaired people. The slideway is designed with alternating clockwise and counterclockwise spirals so as to ensure that those who ride it will not become dizzy as they descend. 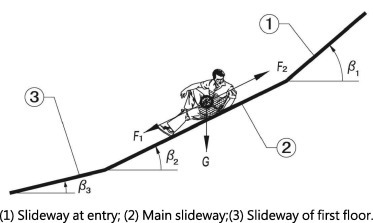 The researchers recommend that people evacuating using the slideway wear some sort of protection padding, since friction with the slide may cause injuries. According to their calculations, the engineers found that people in emergency situations could potentially evacuate buildings faster using the slideway than they would using traditional staircases. Aside from functioning as a fire exit, the slideway can also be used as an alternative to stairs and elevators in skyscrapers, as it could potentially save time and energy in day-to-day use. The number of skyscrapers worldwide that have caught fire proves that there is a real problem. Even though skyscrapers are built to resist fires, it often takes time to respond to fires in them – enough time to kill and injure people and damage property. This, considering that skyscrapers are often built to absorb density, making them useful in helping to off-set the housing crisis in cities. And while building codes have become more stringent over the past 133 years since the world’s first fire-resistant skyscraper came up in Chicago, challenges like speedy evacuation in skyscrapers remain unresolved even today.